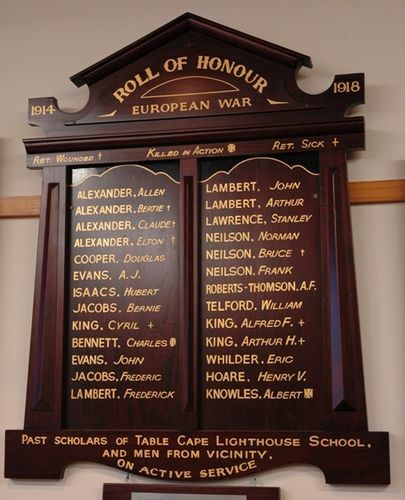 An honour roll from the defunct Table Cape Lighthouse School commemorates those who served in World War One. In spite of the inclement weather, there was a large attendance at the public school, Table Cape, on Thursday evening, when the ceremony of unveiling a Roll of Honour to the young men who had volunteered from that district was performed. There was also a large and representative delegation from Wynyard. The Warden said that it was with feelings of pride that he presided there in his own particular district that night. They were about to honour the 17 young men who had gone out to stand against the most barbarous foe the world had ever seen. There was not one home in the district that was not represented at the front. He rejoiced to know that of their 17 men not one had fallen. They were all still in active in service. He congratulated Mrs. Alexander on the fact that four of her sons' names were inscribed on the Roll of Honour about to be unveiled. He congratulated all the people on their great spirit and enthusiasm for the cause of Empire. Examiner (Launceston), 25th August 1917.